Roma players are skeptical about possible departures in the ongoing transfer window, following the transfers of Mohamed Salah and Antonio Rudiger. The Italian giants have lost two key members of squad to the Premier League, as Salah joined Liverpool and Rudiger moved to Chelsea. Midfielder Parades has also left for Zenit St. Petersburg, leaving Roma light of quality players for next season. As a result, Kevin Strootman is fearing the worst, that even more of his teammates could be on their way out of the Rome-based outfit. 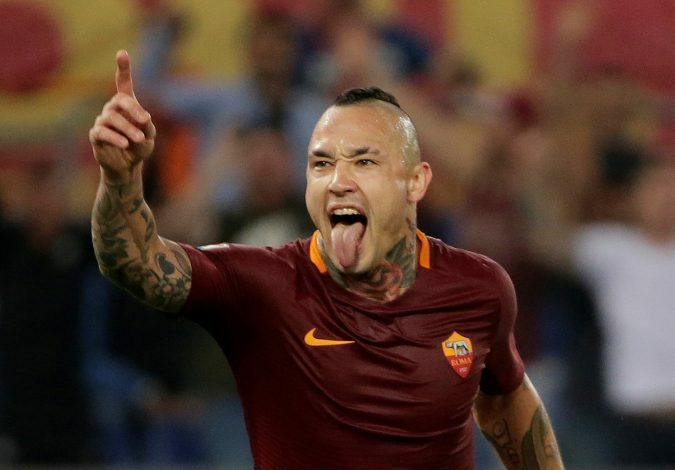 Replying to the above-mentioned post, Radja Nainggolan said: “I don’t know (Laughing Smiley)”. The Belgian midfielder is being heavily linked to Premier League clubs like Manchester United and Chelsea, and could make a switch in the current transfer window. The player is highly admired for his all action play in midfield, and his high work rate makes him a good team player.